Leadership is the art of getting someone else to do something you want done, because they want to do it.- Dwight D Eisenhower. Have you ever wanted your staff or team members to do something for you, and they agree to do it, but when it comes to it, they just don’t! I know I have. You try your best, do everything you know how to do, but nothing happens. Even worse, they go off in a different direction.?!?! So why is that? I hear you ask. And what can horses teach us about leadership? Well, in our work here at Berrison, we use lots of ‘experiential activities’ One of these activities is using ‘Equine facilitated learning’, to help leaders to connect and communicate clearly and with purpose, whilst better understanding the impact that they have on others. Of course it doesn’t have to be with horses, all though this activity is extremely powerful. Leading people is a sophisticated skill set. One that as managers, we often get very little training for. If you’re lucky you might have had training on: the different types of leadership, how to delegate, handle conflict, meetings etc. But what we are talking about here, goes way beyond that. The understanding of how you communicate, and I’m not just talking about the words you speak. Please consider the notion of the ‘space’ that you create for others. By that what I mean is simply….as an individual approaches you, what type of space is created for that person? What energy is coming from that space? Does the person approaching feel more comfortable, or more intimidated as they get closer to you? Are they feeling welcomed and invited to approach, or are they feeling it is safer to keep their distance? (This is what the horses react to.) These are questions each of us as leaders must ask and be considerate of as we interact with people. And the qualities, which fill that space, must be what guide us in our interaction with others. Upon consideration of this notion, we ask leaders to decided upon certain qualities and attitudes that should be present in ‘their space.’ They are a mix of your values, your beliefs, the things that are important to you. If you want to be able to motivate your people to work on your behalf, then it’s extremely important to attend to aspects of your style to understand the impact that you have on others. This is the art of leadership. So why on earth would we use horses to help us understand how to become a better leader? And how on earth could a horse provide insightful and meaningful learning without uttering a single word? Well here’s how. 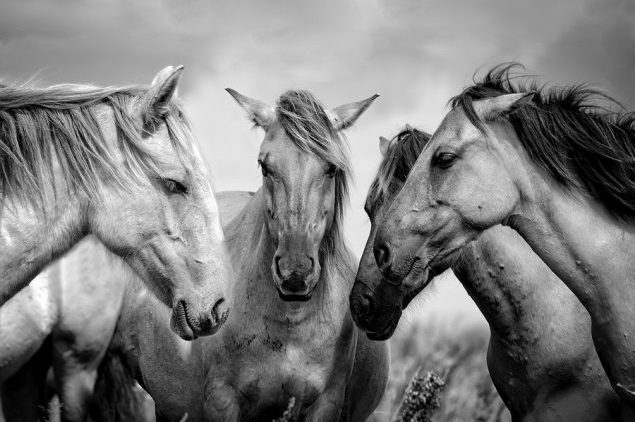 Horses live in a heard, they rely upon small and intricate communications from the herd members for survival. As prey animals, horses are constantly alert to potential danger, so are extremely sensitive to their environment and those around them. As such they are very strongly aware of the energy, intentions and non verbal communication of others. They respond honestly, in the moment, providing non-judgmental reflection of how we are behaving. Therefore, they are a perfect mirror to work with when you want to examine behaviour. The horses reaction is a silent, honest and dispassionate response to your energy and emotions. These non-vebal cues are facilitated by your coach. You are encouraged to explore your behaviour, thoughts and feelings, ultimately giving you the opportunity to look at, understand and re-evaluate your habitual behaviours. What blows me away when working with horses, is as soon as you doubt, feel insure, panic, the horse responds instantly. Conversely, if you are confident, clear about what you are doing and where you want to go the horse will follow. They will give you clean, fast reacting feedback. Horses do not have agendas, nor intentionally mislead. Therefore, working with horses creates a non threatening environment that reveals aspects of yourself, that may be presently hidden from you. How you collaborate and work in a team. They then look at what emotions and behaviours are getting in the way of the goal, and make suggestions as to what you can do about it. The most important factor is that you can see for yourselves what a mammals natural repose is to your behaviour… instant feedback! Wouldn’t it be lovely to get that kind of feedback in the work place, to know, was it effective or not? did it give you the outcome you were looking for?… Would it surprise you if I told you that you can? Do you have lots of millennial’s who just turn up and don’t really care? Well, it may be time to consider ‘ what space do you create.’ Are you sending the correct messages or, are you subconsciously sending the opposite signals through your non verbal communication? If you want to find out drop me a line and I’d be more than happy to chat.